When People Search For You Online Do You Like What They See? Watch Our Video To See How We Can Help Your With Your Online Reputation Management. 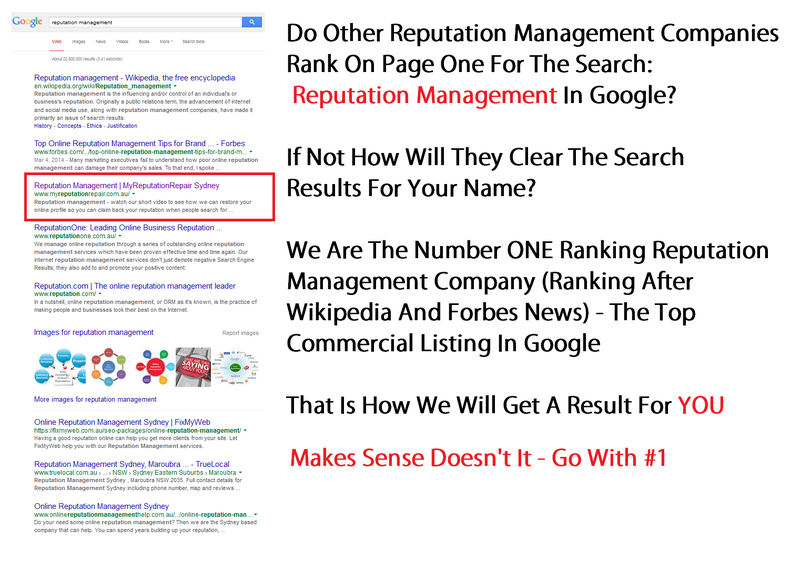 We Will Get You A Faster, Better, And More Comprehensive Result Than Any Other Reputation Management Company – Experts in Managing Online Reputations. What Do We Do With Negative Listings? The answer is that we push them from page one onto pages much deeper in the search results. Research shows that very few people dig deeper in the search results past the first couple of pages. can also play an importnat role in you reputation profile, be sure to monitor and update your social media to maintain a clean reputation across all branding channels. We create strong positive listings which promote your brand, your company or even your personal name. Very quickly, with our top SEO techniques, unique linking strategies, and influence on user metrics, these new positive listings replace the negative listings and push the offending material out of sight repairing your reputation. We do this by creating a complete network of websites, Australian Social Media, positive reviews, testimonials, directory listings, and press releases which we optimise to dominate the search results. Our team are all experts in search engine optimisation, public relations and marketing. All of our websites are developed to the highest standards and can be used to positively brand you if you so wish, and then they are interlinked to create a barrier against negative search results. Once this has been done we continue to add to and promote these positive listings over time. So not only do you remove the offending material from where people can find it, but you also create a positive online presence for your brand, company or your personal name. We do all this – and then add into the mix our “secret sauce” promotion methods that NO OTHER COMPANY IN AUSTRALIA is offering. Find out how we can do this for you by calling us now on (02) 8005 0339 for a no obligation chat during which we will quickly analyse your problem and present you with the best solution. You are under no obligation to proceed. Please allow a few seconds for the video to begin. 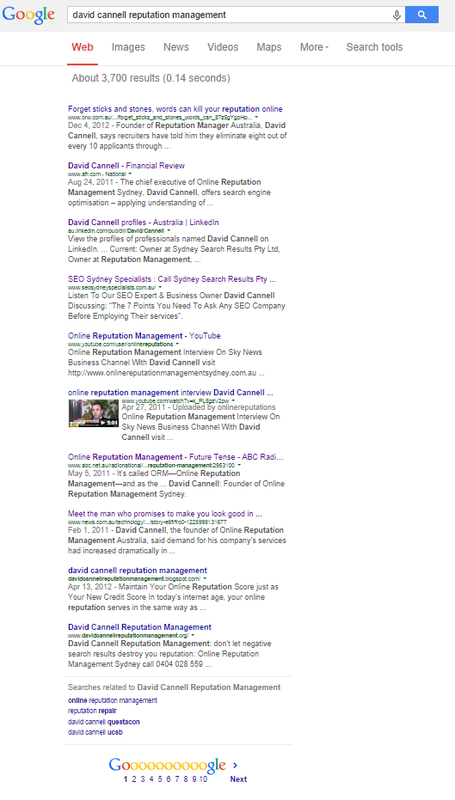 Our Business Owner David Cannell Discussing How We Can Manage Your Online Reputation. We can help you clean up your businesses online reputation. Did you know that over 85% of consumers check out a company online even AFTER they have decided to purchase from them. And if they see one negative review or ‘scam report’ over 75% of those consumers then CHANGE their purchasing decision. Did you know that over 80% of Human Resource Managers cull the job aplication CVs and resumes of job applicants by searching for candidates online – in less than 10 minutes. Did you know that the search results can damage your business and close doors on your career. We can help. We have been successful online since 2003. Go with the most established company in Australia – go with the best.